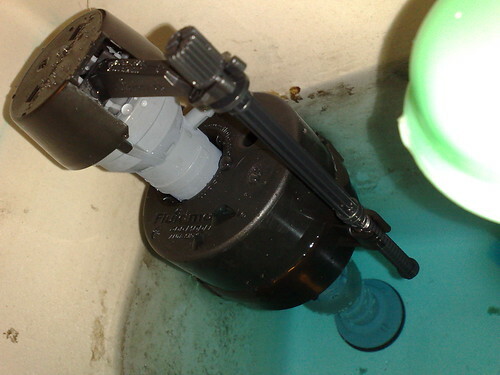 I fitted a replacement float value to fix #wontstopflushing toilet DIY ftw! I like to get out of the office at lunchtime and if its fine weather I’ll often go for a walk by the river. I’m quite fortunate to work very close to some easy to walk sections of the Five Weirs Walk. In an hour, I can do a nice round trip along the river from Brightside Weir, following the water around the back of the Meadowhall centre, then switch to the canal towpath following the Tinsley flight of locks back to the office. This week the weather has been excellent so I made the round trip on both Tuesday and Wednesday, rolling up your shirt sleeves and feeling the sun on your skin is a tonic after a busy morning in the office. The urge to exercise has also been strong this week, I’m sure in a big way influenced by the brother-in-laws recent health problem. I’ve, of course, noticed the various plants and trees along the route and was quite disappointed to see that all the figs have been stripped from a couple of trees. I suppose the Meadowhall gardeners have done this to avoid the mess of dropped fruit on the property, it seems a shame though. What they can’t control are the Blackberry bushes along the river and towpaths, there are loads of them and they’re coming into season for picking. On Wednesday I saw a man picking the fruit and thought I would like some of that too! 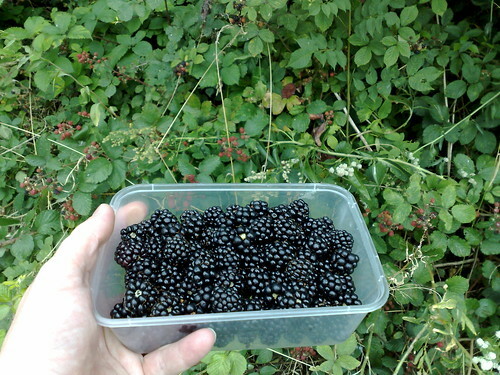 Here’s a picture of me (my hand actually) on Thursday after I’d spent half an hour gathering fruit. I got a few funny looks from a couple of passers-by but heck what do I care! A nice thing happened too, a couple out for a walk with their 2 young grand-daughters stopped to chat, I mean how often does that happen nowadays? We talked about the fruit, the weather and I gave them directions to get onto the next section of the walk as some of the signs aren’t great. So there you go, free fruit and a nice warm feeling inside, not a bad way to spend a lunch break, why don’t you get out of the office and see what you can find? In which I come clean about being a skinflint, but no more! On Sunday afternoon, halfway through ironing work shirts for Monday, the iron started playing up. The steam stopped coming and instead water started dribbling everywhere. “No problem”, I thought, we’re heading to the airport to pick up the brother and sister in law, we’ll set off early and pick up another at Asda. Doh! Paul reminded me it was Sunday and the 24 hour Asda didn’t live up to the name on the sabbath. The comment about popping into Asda and buying another one appears quite flippant and really doesnt do justice to my shopping history. I suppose this is the bit where I come clean about how I’ve been such a skinflint with irons over the last few years. We bought a new iron when we moved into the new house and I have to admit I bought a cheap Asda model for less than a tenner. It broke down after two years and I thought to act daft about how old it was, pretend I’d lost the receipt and chance my arm and take it back for a replacement. They didnt sell the same model any longer, no surprise after that time, and even the barcode had been reassigned to a television. After some discussion the nice lady agreed to replace the iron and found what she thought was the discontinued iron product code. I happily agreed that it sounded like the fifteen pounds I paid (hehe) and I left the store with a new Morphy Richards worth twenty quid. Score so far, two years ironing for £10 and an upgraded iron. The story doesnt end there, two years later the new iron stopped working, the steam burst button wouldnt press down so I took it back. So in March 2006 they swapped it for a slightly updated version of the same model. At no cost! Score so far, four years ironing, total cost £15 and in fact this brings us right up to date and the third iron giving up the ghost. So in fact that make the score seven years ironing for £15. 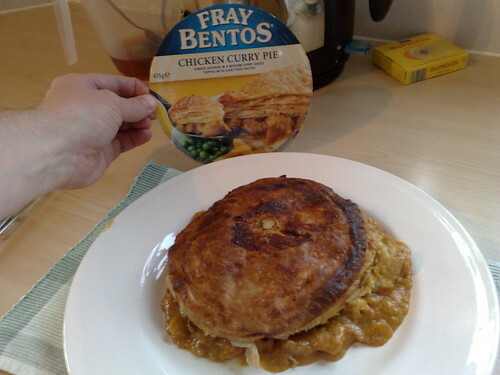 How good is that! Except, after all that I’ve never been that happy with any of those irons. I’m the chief ironer in the house, which is more about my control freakery than anything else, and I just never loved those irons. I was thinking about this on Monday while looking for a new iron to “pop” out and buy and decided that no longer would I scrimp! 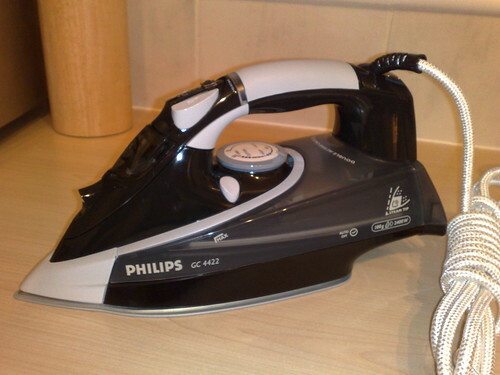 I wanted to have an iron that can simply DO the job. In my search I found this iron and knew I had fulfilled my quest!. The next day I got to try out the new iron and OMG I ironed two shirts in half the normal time. I’m not kidding when I say it is amazing, upon unpacking I was slightly upset to find the steam burst button on the wrong side for my thumb. After ironing two shirts I noticed that I hadnt even had to press the steam button once and results were amazing. Compare this to old irons that needed steam button pressing constantly with poor results. The morale of the story is here. I spent quite a lot more than I normally would and was rewarded. You are currently browsing the archives for the mobilephone category.